Software for ID Cards provides supreme designing technique to create bulk of identity labels within few seconds. id card designing tool saves precious official time by quick production through advance designing features. Creating thousands of unique id cards for students/employees and other staff is no more big deal through such brilliant id card generator program. Creative id card maker tool offers various smart techniques to generate colorful cards in various shape and size for as per your own choice. Latest id card designing application provides highly user friendly interface to make solution simple to use for any novice user. Premium id card creator tool generates different identity cards by make use of latest designing features like pencil, star, ellipse, text and many more. Brilliant software for making ID Cards saves precious business time and manual efforts in order to improve your business efficiency in an easy way. 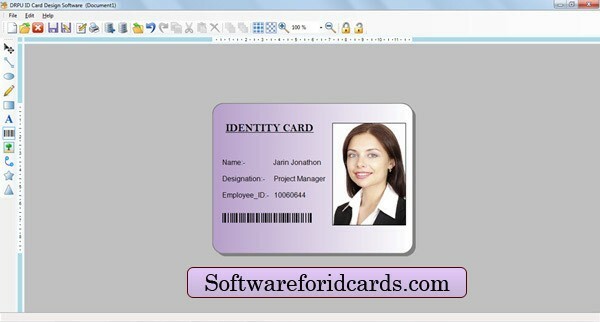 www.softwareforidcards.com brings easy to use id card maker program which designs multiple identification cards for your company’s staff within few minutes. Card maker tool provides inbuilt data set features to generate millions of colored identity cards in an easy way. Easy to use id card crafting tool is highly compatible on any advance Windows operating system XP/ Vista to generate bulk of id cards in seconds. *Comprehensive id card maker software effectively saves time and manual efforts by providing latest designing features in this regard. *Simple to use id card designing program is integrated with user friendly interface to provide convenience to any novice user. *Brilliant id cards generator tool package help to craft personal use id cards in your own size or shape as per choice. *Smart commercial identity card maker utility generates attractive, colorful and printable student id cards in bulk.